William H. Truswell MD, FACS, limits his practice to facial plastic surgery. A Massachusetts plastic surgeon who's also running a medical spa? We got together to see what Dr. Truswell has learned in 30+ years in practice. That's interesting: Dr. Truswell is the author and co-author of several books including: Your Complete Guide To Nose Reshaping, Your Complete Guide To Facial Rejuvenation, Your Complete Guide To Facial Cosmetic Surgery, The Non-Surgical Facelift, and Surgical Facial Rejuvenation. A believer in returning something to the community, Dr. Truswell participates in Face to Face, the pro bono domestic violence program of the American Academy of Facial Plastic and Reconstructive Surgery. He has performed numerous reconstructive procedures for victims of domestic violence. These women are referred in from recovery programs, are completely separated from their batterers and are working to restore their self esteem. That recovery is helped by erasing the physical evidence of beatings such as scars, deformed noses and unset facial fractures. Can you tell us a little bit about your history as a plastic surgeon? I did a double residency in Otolaryngology and Facial Plastic and Reconstructive Surgery at the University of Connecticut School of Medicine. I performed the first facelift ever done in Northampton, Massachusetts in 1977. Twenty years ago I limited my practice to Facial Plastic Surgery. Facial cosmetic surgery is the perfect blend of art and science. I come from a family of artistically talented people. My mother was an artist as is my son. I just have a different medium – the human face. What kind of services do your Aesthetic Laser & Cosmetic Surgery Center offer? My office is over 4500 square feet and designed to look like a private club in the reception area. This is a good-sized room with a vaulted ceiling and a glass wall. We have an accredited operating suite and I perform all of my cases in this private setting. I perform facelifts, endoscopic forehead lifts, blepharoplasties, rhinoplasties, otoplasties, facial skeletal implants, soft tissue facial implants, and fractional CO2 laser resurfacing as well as Juvederm, Restylane, Radiesse, Botox, Xeomin, and Sculptra. We have our own medical spa called Syzygy (syzygy is when the Earth, sun, and moon lie in a straight line – or the perfect alignment of heavenly bodies). Our medspa offers light and medium chemical peels, microdermabrasion, make-up services, massage, laser hair removal, laser treatment of broken blood vessels and dyschromias, and Thermage. My office manager is my wife, Lynn Truswell, J.D. We are in Northampton, Massachusetts. My patient population is predominantly from New England and the Northeast, but after 35 years in practice, I have patients from all over the U.S. and from as far away as Europe, The Middle East, and Australia. Most of our employees have been with us for many years. Even the ones who have left to start a family or move to another state stay in touch and say it was the best job ever! In many ways we are a small family, and pull together under caring but demanding leadership. It is important to treat your employees with respect and reward loyalty and excellence. An appreciated perk for our staff was to close on Friday’s at noon (no more missed time for appointments), and we provide lunch daily. Our esthetician does receive commission on peels and products as well as a base hourly, but the rest of the staff is on competitive salary. How have you incorporated new technolgies and cosmetic lasers into your practice? Lasers have been an integral part of my practice for almost 20 years. I have been using the Lumenis Ultrapulse Encore CO2 laser for two years and the Ultrapulse 5000c for the preceding 17 years. This laser I use as a cutting instrument in surgery and for fractional and ablative CO2 skin resurfacing. I am also on my second Lumenis Lightsheer for laser hair removal. The third laser I have is the Iridex Diolite 532nm laser for telengectasias and brown spots. The Lightsheer and Diolite procedures are performed by the nurses in my office. The nurses also perform Thermage for patients. How do you market your clinic to drive new patients? We have given seminars in our office for many years. 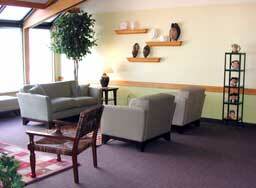 We have a large reception area that can hold up to 40 people with creative seating. Google clicks, newspaper ads, tv spots, supporting local arts- we’ve done it all and created a brand in our area over the years. Best source for new consults? Referral by other patients and that is now our number one source for new business. Still need to keep up our name and services out there but our budget for advertising is a fraction of what it was 5 years ago. Where does the majority of your revenue come from? The most profitable part of my practice is cosmetic surgery. The medi-spa does provide a steady income stream. It is an excellent compliment to my cosmetic facial surgery practice. Patients have a foot in the door and find it very easy to make the effort to consult about surgical procedures they may desire. My nurses and estheticians are a great source of referrals because of the Spa’s incorporation in the office and their intimate knowledge of the surgery practice. My wife tells a story about a handsome well-dressed couple at the financial ‘closing’. After the figures were given, the wife turned to her husband and said “Well, what do you think?” He replied that it was a lot of money…at which point she straightened up and retorted “You just bought a $65,000 car that lost 30% of its value when you drove off the lot…WHAT are you talking about”…he sheepishly and red-faced quickly agreed! What's the most valuable lesson you can share to physicians? Cosmetic surgery is unlike any other field in medicine. It functions without third party payers, and if one has his/her own facility, the hospital. I believe that the most important item the facial plastic surgeon has to offer patients is him/herself. Having the greatest surgical skill set, the most elaborate and beautiful clinic, and a mile long resume is wonderful. However, what we must keep in mind is that the most important item we are “selling” to the patient is ourselves. Patients come to us because we are very good at what we do and have excellent reputations. They also come because we are doctors, and doctors take care of people. The most successful in our field are caring, friendly, cheerful people. About: Dr Truswell did a dual residency in Otolaryngology/Head and Neck Surgery and Facial Plastic and Reconstructive Surgery at The University of Connecticut School of Medicine. He is Board Certified by both specialties and practices only Facial Plastic Surgery. He is also a Fellow of The American College of Surgeons, The American Academy of Facial Plastic and Reconstructive Surgery, The American Academy of Cosmetic Surgery, The American Society of Laser Medicine and Surgery, The American Society for Head and Neck Surgery and The American Academy of Otolaryngology and Head and Neck Surgery. He is a founder and incorporator of The Richard T. Webster New England Society of Facial Plastic Surgery and a member of The American Medical Association and The New York Academy of Sciences.